The HealthRider R60 SoftStrider treadmill is a surprising model in the ICON company line. This unit is largely overshadowed by more prominent treadmills in the mid-price range. It’s a shame that it’s not better rated among HealthRider treadmill reviews, because it’s not a bad unit. The R60 is a gorgeous machine really, and very good for avid walkers, but a serious runner may want to take a pass. The HealthRider R60 SoftStrider treadmill offers iFIT® compatibility which automatically controls the speed and incline of the machine so that you can concentrate on losing weight and toning up. UPDATE: The R60 SoftStrider model is no longer available. You can check out all of the new treadmills for sale at the Healthrider online store for special deals. You won’t find a great motor in this model so experts aren’t all that warm and fuzzy about recommending the HealthRider R60 SoftStrider treadmill, yet it does have many positive features. The company has set about to install better quality parts in their machine in order to stay competitive, and the gamble seems to be paying off. This treadmill is not something a serious runner should purchase, but this is a good walker/light jogger’s machine. Consumers are pleased by the price as well as the roomy running surface, the very attractive BioLogic display console with convenient power incline and quick speed controls, the six preprogrammed workouts, plus the two pulse-driven cycle programs, and two user-define programs. The cushioning, noise, and overall quality of the HealthRider R60 SoftStrider are a pleasant surprise. We found ourselves drawn to this treadmill and its console; the electronics are nice, the display is well laid out, it’s easy to read, and fun to workout on. Other than the wimpy warranty (but you can buy an extended warranty), this little machine actually has the fire in the belly to compete with others in its class. 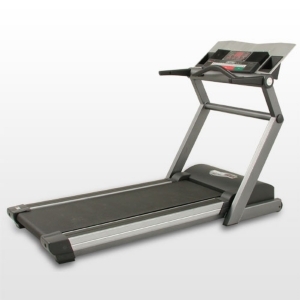 The web price is $1499 which is a fair price for the HealthRider R60 SoftStrider treadmill.